Finally a game where the bad guys can win. Crookz: The Big Heist is tactical strategy game where you direct a gang of professional criminals to commit heists! There are (currently) 18 heists that players can commit in a groovy 1970’s setting. 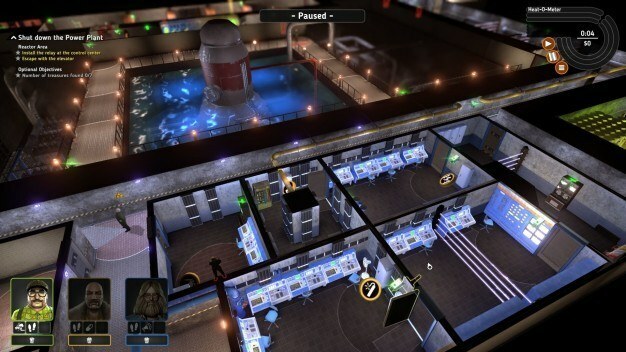 Crookz: The Big Heist has a very interesting way to play. Each mission has multiple phases. Phase 1 is the briefing stage. This is where your benefactor (person funding the heist) tells you exactly what needs to get stolen and what to watch out for. The cool cats of the crew join in on the discussion and break down the heist step-by-step, floor-by-floor. You learn about the layout of the building and any security measures, electronic or otherwise, you’ll encounter while cracking the joint. This way everything is understood and there (hopefully) won’t be any surprises on the job. Ya dig? Phase 2 is the planning stage. Here the player has several options available to them. 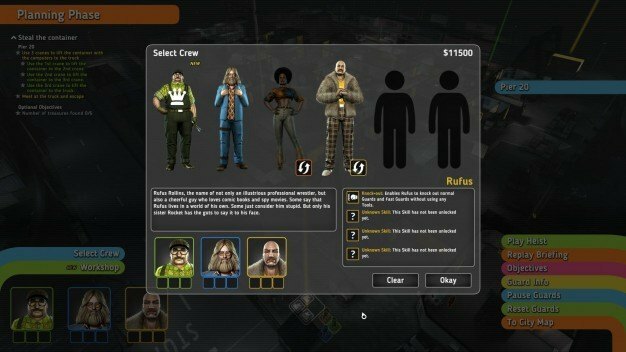 They can customize their crew as seen in the screenshot above. Each crew member has special abilities and skills unique to them and their role. Some missions require the use of certain characters, but the remaining slots in the heist team are up for debate. Different thieves have various talents that might make them more useful than others in a heist. So choose wisely. Beginning the heist is when all the tactical elements of this intricate game come in to play. Players first pause the game, give each character a command, such as pick lock, walk here, subdue guard, etc and when you un-pause, the thieves carry out their assigned actions. It was a little tricky at first micro-managing 2-4 characters but I eventually got the hang of it. Remembering to pause after each action was crucial because not only was I being timed, I also needed to figure out what steps came next. Several times I found myself staring at the screen like an idiot, deciding what I had to do next and who had to do it. Then I had to make sure to coordinate my crew’s next steps properly so they could avoid any security. One thing I would like to mention is that Crookz: The Big Heist has a phenomenal tutorial that you can replay again and again. You don’t just learn what button does what, the tutorial teaches you the proper way to run your team: when to wait, the importance of swapping items, the concept of “heat” and much, much more. It’s far out man! 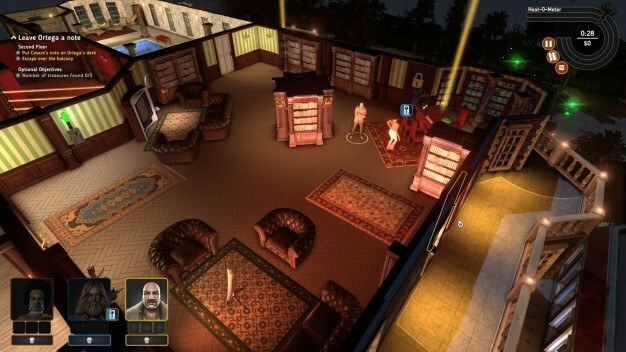 Crookz: The Big Heist is a funky fresh tactical game that fans of the genre can get down with. I enjoyed being the mastermind for a group of professional criminals. I had to take each of their strengths and weaknesses in to consideration and think several steps ahead in every level. It wasn’t easy, which I appreciated. So if Crookz sounds like your bag man then plan to score it on August 25th when it gets released on Steam. In the mean time you have check out the groooovy Crookz live-action, short film. It stars none other than adult film legend, Ron Jeremy! Right on.